There is something to be said of wearing 100% wool dress pants. You immediately notice that when you wear slacks that are made of fine wool, you know it. It's a luxury that other fabrics may try to imitate but can never ever duplicate. That is because when it comes to dress pants, wool is simply the real deal. You'll find at Contempo, our selection of 100% fine wool dress pants come in styles that will please most men who shop for stylish menswear here online. You'll find that we carry classic pleated wool pants, flat front style wool pants and even the edgy looking wide leg wool pants all made of super 150s fine wool fabric. If you like to dress in a stylish manner that has a more Urban feel. 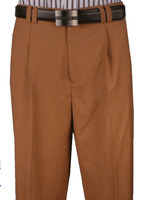 Try some of these fine 100% wool wide leg dress pants that will keep you not only stylish but quite comfortable as well made of super 150s wool fabric. 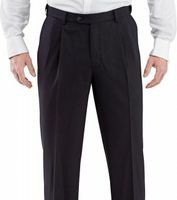 Shop here for classic style pleated 100% wool dress pants that are made of super 150s fine wool fabric that you'll simply treasure wearing.